Mr. and Mrs. J. Francis Austen, Capel Manor, Horsmonden, Kent, England, from at least 1877 (sale, London, Christie's, 18 March 1921, lot 85, ill., as Amico di Sandro. ?bought-in). 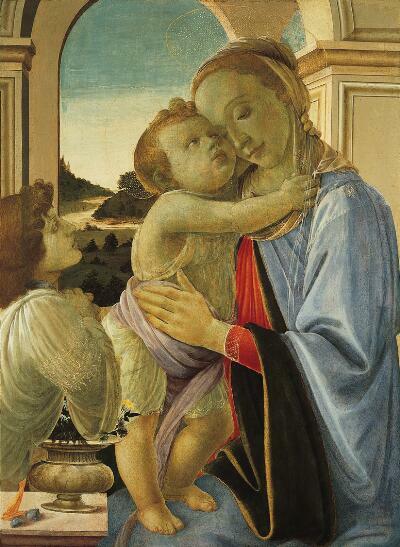 The art historian Lionello Venturi greatly admired the translucent coloring of Botticelli’s Madonna and Child with Adoring Angel. In concert with the graceful, linear design, it conveyed the gentle lyricism for which the artist was famous. Notice the virgin’s smooth, elegantly drawn features, the tone-in-tone handling of the drapery and the angel’s profile, isolated against the distant landscape. The architecture, too, is rendered with great precision, leading the eye into a space firmly defined by the stone wall, pillars and arcade. The pigment on this panel has faded over the centuries. It exposes the underdrawing of the architecture beneath the angel’s face and sleeve, suggesting that he was painted last. He leans into the picture as if from our space, gazing adoringly at the mother and child, encouraging us to do the same. Sandro Botticelli, one of the most influential and esteemed painters of the late 1400s, was a protégé of the powerful Medici family in Florence, for whom he painted portraits and religious scenes. He was largely forgotten after his death, but his reputation was restored in the late 19th century by a group of English artists known as the Pre-Raphaelites, who rekindled popular interest in the art of the early Renaissance.